Comedian Phil Lloyd plays the narcissistic yet loveable Myles Barlow in this mock TV series that reviews many taboo topics of mainstream society such as Racism, Addiction or 9/11 Jokes. The series also got into some hot water by mainstream channels when Myles Barlow reviewed a topic on killing Karl Sandilands, the former Australia Idol judge. The humour in Review is quite politically incorrect due to its dark themes and of course the nonchalant behaviour of the realistic Myles Barlow but somehow it comes together perfect and season 2 is another prime example of this! With six episodes featured in this collection Myles Barlow juggles a handful of topics in each episode with one or two topics taking centre stage, thanks to a "reader" letter. Episode revolves around Wanderlust and whether the "grass" is indeed greener on the other side to Addiction as Myles scrapes the bottom of the barrel, even stealing money from his kids to fund his cocaine habit. From starting a cult to a "Tree Change" where Myles ends up being a hermit in the "remote" wilderness, only to discover that he was only a few kilometres from civilization, seeing the journey of this reviewer and his seriousness is quite laughable. Another thing which makes the series so amusing is the dialogue by Marlow as uses some amazing words and clichés to tell his exaggerated reviews such as "the horse that bolted onto the ship of insanity that sailed several months ahead of its departure time" which mocks the review world perfectly. It's all Champaign comedy. My favourite episode is watching Myles find inspiration to become an artist where he discovers a syringe in the gutter and explains that this item has seen euphoric highs to bitter misery, it had seen it all. What does Myles do? He decides to collect used syringes to make lights. It's definitely a WTF moment, especially when he creates his own drug den to collect used syringes. Brilliant! The video quality is presented in 16:9 widescreen that looks good on a FULL HD TV with no errors whatsoever. Add in Dolby Digital 2.0 and this is a well produced series that looks, sounds and more importantly comes together well due to the strange review topics. A special mention should also go out to the great "review" music, thanks to composter Matt Blackman that almost makes it sound like you are watching a real review program. Season 2 also comes with some light special features such as the "Making of Series Two" featurette, a Christmas Special and the classic Logies Sketch. 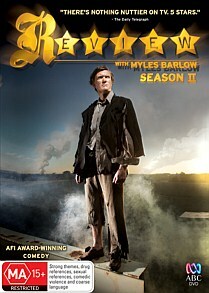 This is easily the best comedy series on TV and even though it makes a mockery of many taboo's in society, it's the journey of Myles Barlow and how he reviews them which sets this series apart from other comedy shows and is definitely the topic on the cake... Review with Myles Barlow Season II... FOUR STARS!